About two-fifths of New Zealand’s Irish immigrants were Protestant, most of them from the northern counties of Ulster. Among those who came from this area were up to 4,000 people brought out under the initiative of George Vesey Stewart. They settled in Katikati and Te Puke in the Bay of Plenty. 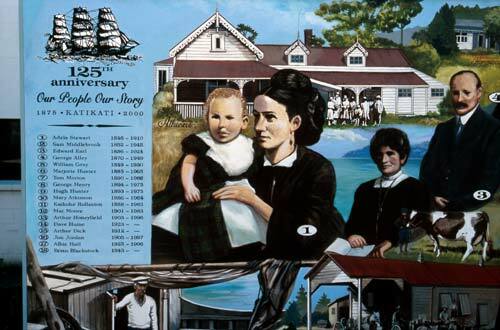 Today Katikati remembers its Ulster Protestant settlers in a series of murals on the main street. This one shows Adela Stewart, George Vesey Stewart’s sister-in-law, standing in front of her home, Athenree. She wrote a famous account of her life at Athenree, My simple life in New Zealand.